Valentine/Love Blog Hop – Welcome! I love non-traditional colors. Very cute card. So beautiful! I love your color choices! Love how this card can be used for different occasions! Fun colors, too! Very pretty and I love one colors together. Lovely elegant card! So appropriate for many occasions. Love the card! Its beautiful. Beautiful card! Love the flowers and your color combination! Really pretty. I like the layout! Beautiful card! Love the flowers. So pretty! 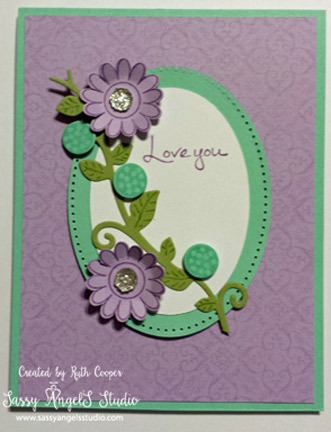 Love the monochromatic background stamping and the pretty floral spray. I don’t think I have that set yet…I’d better check my inventory! The bling adds the perfect sparkly touch! Love it! Great card, and colour combo, well done, Ruth. love the flowers here (I’m just partial to flowers LOL) and the overall card is delightful and beautiful.